“Ennesima,” best translated as “umpteenth,” is a meta-exhibition as it reflects on itself. It is divided according to seven working hypotheses that make it possible to interpret and reinterpret the past fifty years of Italian art through seven exhibition formats and 170 works by more than seventy artists. 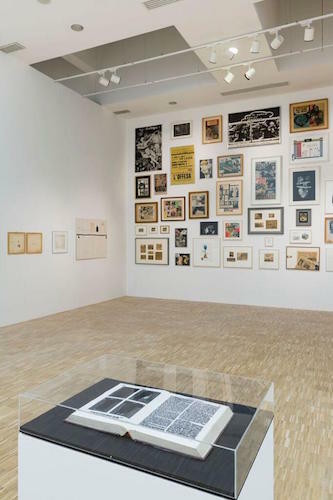 Curator Vincenzo De Bellis has clearly worked from a desire to express the natural coexistence of these formats, without locking himself into one project that attempts to show stylistic connections at all costs. Already in the first section, “Per la scrittura di un’immagine” (For the Writing of an Image), focused on iconography, De Bellis demonstrates sensitivity in establishing sophisticated relationships among the works on view. He has succeeded in explicating unexpected reverberations and resonances between the materials used by Diego Perrone and Carol Rama as well as between the folds of fabric immortalized by both the photographs of Giuseppe Gabellone and the paintings of Pietro Roccasalva. Roccasalva and Alessandro Pessoli leave an indelible mark on the viewer’s memory. Pessoli is given a veritable solo exhibition. Titled “Sandrinus, il tutto prima delle parti” (Sandrinus, the Whole Before the Parts), it consists of drawings, ceramics, and paintings. Visitors will feel the strong emotional impact of the group of tableaux vivants that make up the fourth stage of “Ennesima,” including La performance del tempo sospeso: il tableau vivant tra realtà e rappresentazione (The Performance of Suspended Time: The Tableau Vivant Between Reality and Representation) and Tra i giovani della sesta mostra, intitolata: tempo presente, modo indefinito. Format: mostra colletiva generazionale (Present Time, Indefinite Mode. Format: Generational Group Exhibition). Here, Alessandro Agudio, an alchemist who worked with architectural materials and symbols, stands out.